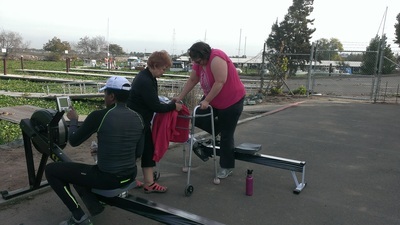 Delta Sculling Center began its adaptive rowing program in July 2013 with the goal of providing people with disabilities the opportunity to enjoy the health, fitness and social benefits of recreational and competitive rowing. Created by a physical therapist who loves to scull, DSC's adaptive program adjusts the sport to the needs of people who have physical, sensory or cognitive limitations. Participants agree that the freedom of being out on the lake lifts their spirits as much as it benefits them physically. Our two adaptive programs are Freedom Rows & Oar Busters. Our club leads bi-weekly coached adaptive workouts using indoor rowing machines (ergometers or "ergs"). We also have the appropriate equipment for rowers who can use only their arms and backs to row or just their arms. Our intention is to exclude no one and include everyone! If you'd like more information about our adaptive rowing program, please contact Pat Tirone or call at (209) 607-9876. Just wanted to give a 'shout out' to the April DSC "Athlete of the Month:" Mario Gonzales. While there are many outstanding athletes [and volunteers] on the DSC team, the 2016 Athlete Recognition Committee selected Mario because of his outstanding attitude, determination, perseverance and superior performance. In other words, Mario, you are amazing, outstanding, awesome and all around inspiring to all of us. A heartfelt congratulations to you. We are all so very proud of you and all that you have accomplished in such a short period of time. We celebrated Mario's achievement this morning with a toast and some fresh strawberries. Of course Mario was too busy getting himself out on the water to enjoy them. Our photos clearly establish though that Mario has the sweetest smile. Mario's photo will be displayed in the boat house beginning next week. Again, go Mario!!!! Aimee finishes a brutal erg workout and can still stand! Mario helps Carol add up all this meters on the erg at the end of his workout. 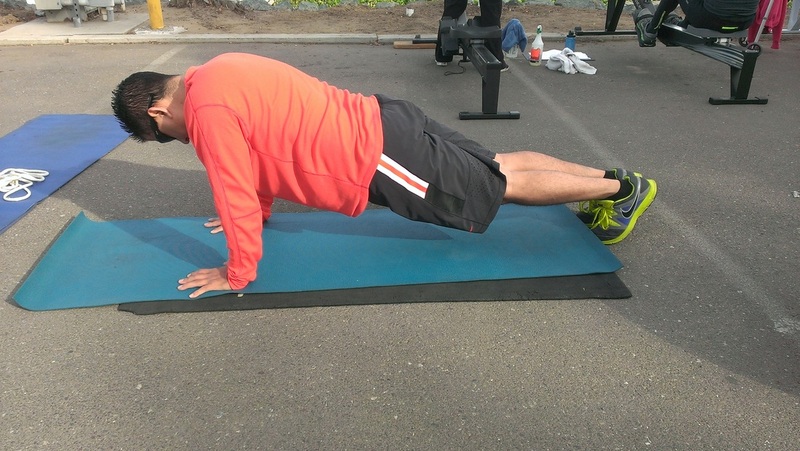 Mario sure can plank! Rock solid! Valdez knows how to push it! A true athlete! Despite what seems likes endless days of being unable to get on the water, scullers in DSC's adaptive program know how to make the best of it! Land-training can be fun! And challenging! The bright yellow and blue T shirts sported by DSC scullers were omnipresent at Bair Island Aquatic Center in Redwood City, August 3rd,site of the first ever BIAC Drag Races. A contingent of two adaptive athletes, ten volunteers, and four of Valdez W.’s family members came over Altamont Pass and across the San Mateo Bridge to attend the all-adaptive scrimmage organized by coaches Mike Sullivan and Jim Wojcik of BIAC and Pat Tirone of DSC. Cloud cover and flat water created perfect rowing conditions for the pre-scrimmage parade of boats and the subsequent races. 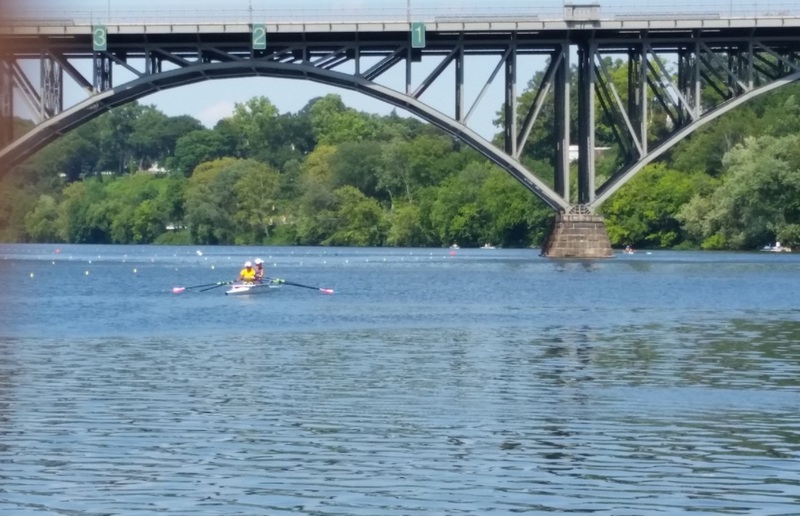 All athletes, including several from BIAC and the Bay Area and one from Alabama, rowed strongly in two or more 250-meter events. 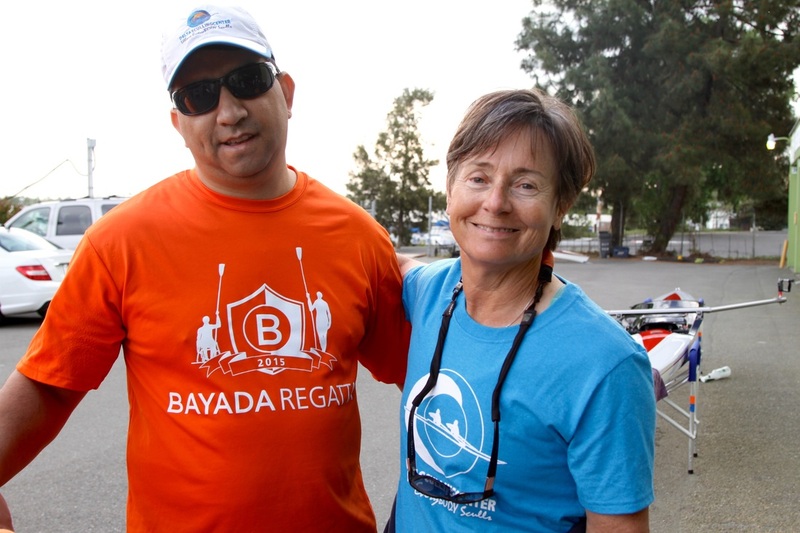 Finishing second in both of his single sculling races, Valdez pushed hard to edge out a sculler at the finish line in his first race, with only an experienced BIAC adaptive sculler ahead of him. Realizing how challenging the competition was, he pushed even harder in his second race, finishing with open water between him and the third-place finisher. Later he raced in a very fast 4+ (sweep boat of 4 rowers - each with a single oar) comprised only by adaptive rowers, his first time ever rowing sweep. 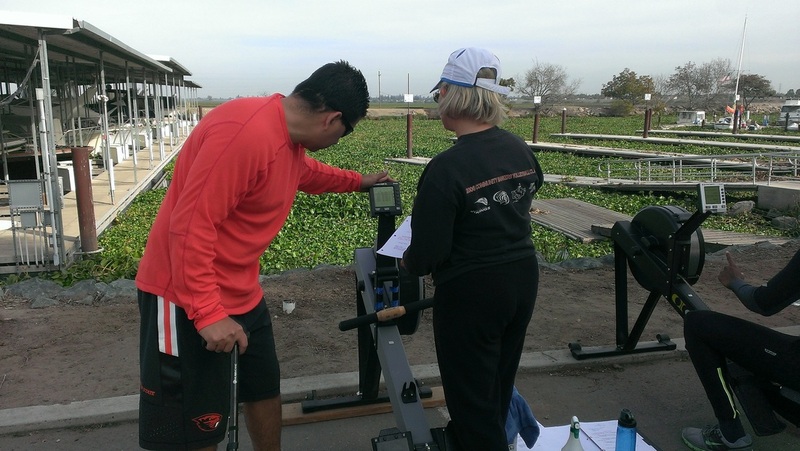 He had an extremely quick learning curve, a characteristic noted often at DSC by Coaches Tirone and Steve Mayo, who comes to and from Sacramento a morning each week to volunteer his time to assist adaptive scullers at DSC. Meanwhile, with volunteer Carol C in bow, Lynette M competed for the first time in a race, only a few months after her first on-water sculling at DSC. She and Carol had a great time as Lynette easily doubled the time and distance on water that she is used to sculling during practices in Stockton. DSC volunteer Dr. Bob L also rowed in the bow of a double stroked by a BIAC adaptive sculler, pushing Valdez’s quad to the limit during their drag races. Scullers Carol C, Bob L, Lynette M and Valdez W and the entire DSC contingent later enjoyed socializing and recounting their race experiences by the food table at the post-scrimmage barbeque. In the safety launch for this special adaptive event was Joy Nix, a US Rowing para-rowing talent scout who is visiting adaptive rowing programs across the country on a fact-finding and expertise-sharing mission. 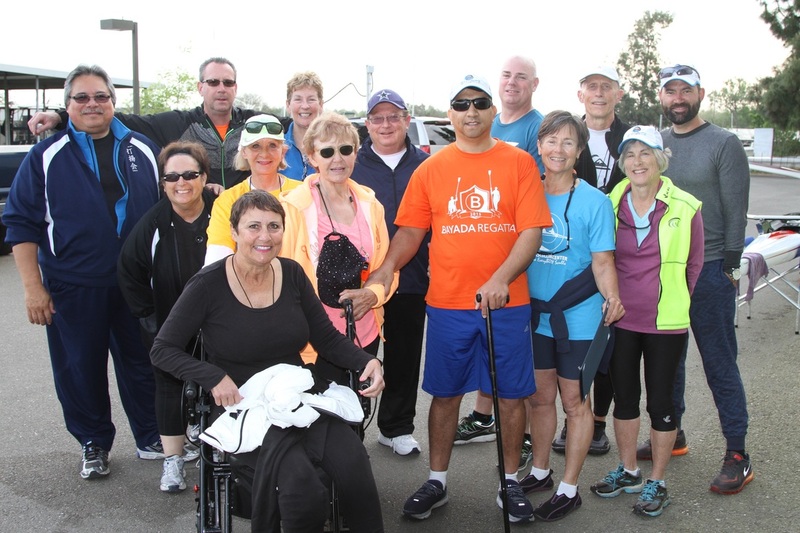 Two days after the scrimmage at BIAC, Joy came to Stockton to work with five of DSC’s adaptive scullers and to share tips with Coaches Tirone and Mayo and several of the volunteers she had met in Redwood City. Coxing from the coach launch, helping with transfers at the dock and with carrying equipment to and from the boathouse, and scanning DSC’s adaptive equipment to suggest tips for small improvements, Joy fit in so well it was as if she had always been a member of the team. She promised to follow up with additional information, contacts and resources, solidifying an already established pipeline between DSC and US Rowing’s Para-Rowing programs. The BIAC Drag Races and follow-up visit by Nix was the highlight of the summer for the Delta Sculling Center, and all involved were encouraged by the promise of future adaptive regattas in Central California. 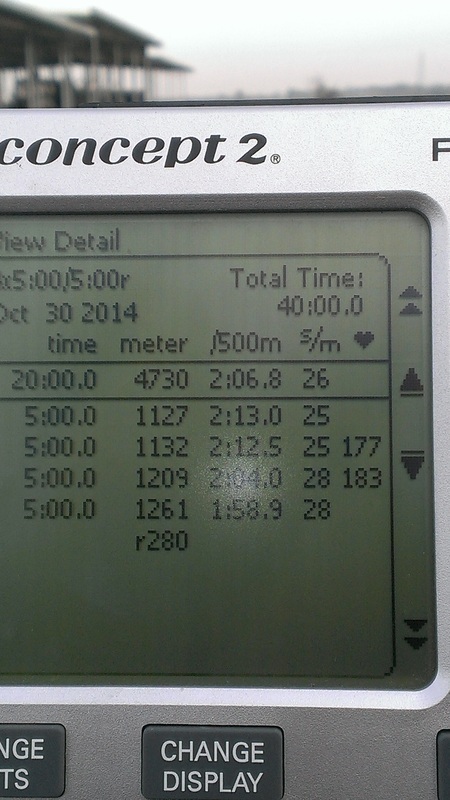 Duke MacGill first learned to row in January 2014. Since then he hasn't stopped! He's already completed two Concept2 Erg Challenges! And he is well on his way to joining the Million Meter Club in record time, especially for someone who rows with a below-the-knee prosthesis that doesn't allow him to bend or straighten his ankle! He literally rows all his meters on the 1/2 slide! Congratulations, Duke, for all your dedication and your incredible learning curve! You're amazing on the water, too, as anyone can see by the video above!